With bad weather forcing Dakar Rally organisers to cancel today's stage six, the Yamalube Yamaha Official Rally Team's duo of Adrien Van Beveren and Hélder Rodrigues, along with Yamaha France supported Xavier de Soultrait, have successfully reached the city of La Paz and are all looking forward to tomorrow's Rest Day in the Bolivian capital. Following a long and challenging week of racing in South America, Van Beveren holds on to an impressive third place, de Soultrait is sixth and Rodrigues currently 13th in the rally's provisional overall standings. Including a 527km-long timed special, stage six was set to be the longest one in this year's Dakar Rally. Taking into account the extreme weather conditions race organisers opted to cancel today's stage forcing all competitors to ride from last night's bivouac in Oruro to La Paz. Reaching the capital of Bolivia in the late afternoon, the trio of Yamaha Racing riders along with all other Dakar Rally competitors and support crews received an impressive welcome with thousands of spectators cheering for them along the streets of the Bolivian city. Enjoying a great week of racing aboard his WR450F Rally machine France's Adrien Van Beveren is currently the highest placed Yamaha rider in the provisional overall standings. Claiming three top ten stage results so far, the Frenchman is third overall, and a little over 16 minutes behind the provisional Dakar Rally leader. Following a well-calculated plan of attack, Adrien's Yamalube Yamaha Official Rally Team partner Hélder Rodrigues finds himself within striking distance to the top 10 in the overall standings. With a long week of racing still ahead, the Portuguese rider is planning to make the most out of his vast experience in rally racing to get closer to the top. Unquestionably one of the biggest surprises of this year's Dakar Rally, Xavier de Soultrait remains a strong candidate for top honours at this rally. Third on stage two and runner-up on stage four, the WR450F mounted rider is set to keep pushing for a top result until the finish. 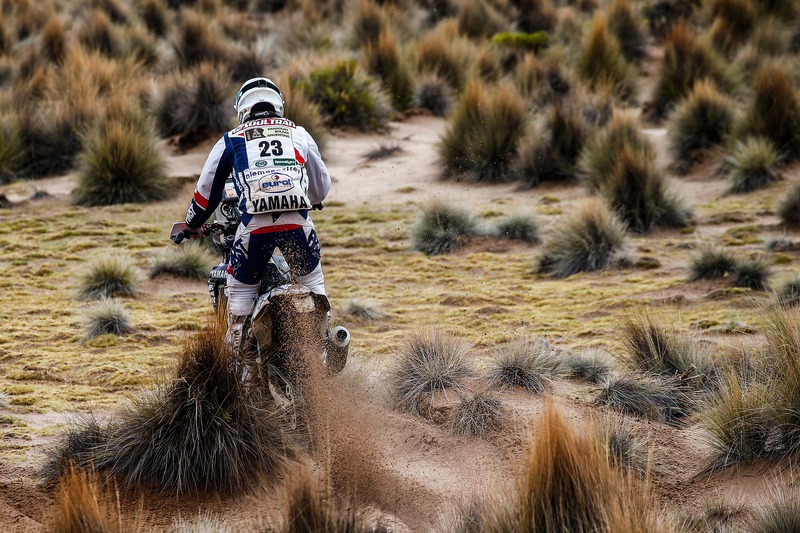 Along with the trio of Van Beveren, Rodrigues and de Soultrait twelve more Yamaha riders reached the Dakar Rally's halfway point in La Paz and will continue battling to reach the finish line in Buenos Aires on January 14. Among them WR450F mounted Spaniard Marc Sola Terradellas is 34th overall, with countryman Oscar Romero following in 38th place. Tomorrow's Rest Day will offer Yamaha Racing riders the chance to get some well-deserved rest ahead of the 2017 Dakar Rally's week two. With more than 4,000km yet to be completed week two of the rally is shaping up to be equally demanding as the first week. "We knew today's stage was going to be one of the hardest at this year's rally, but considering the weather is so bad I believe it was a good decision to cancel it. We expected today's stage to be quite tricky in terms of navigation. Considering I finished third yesterday, I would be the third rider to kick off the stage. In any case, all that's in the past now. Everything has been going according to plan and we made it to the halfway point. The fans here in La Paz have been amazing. With an estimated one million people on the streets there was a 10km line of people cheering for us. It was an incredible moment. Overall, despite a few small mistakes, I'm really happy with things." "To be honest I was looking forward to today's long stage, it would have probably been a good opportunity for me to make up some time and get even closer to the top. In any case, we need to respect the organisation's decision to cancel the stage. Conditions out there were really bad and it's hugely important that we remain safe during the race. We're now in La Paz. The plan is to get some needed rest and recuperate ahead of a long week of racing. It's equally important to regain our energy and also relax a bit mentally. The first week has been mentally exhausting so tomorrow's rest day is more than just a few more hours of sleep. I'm pretty sure that by the end of the rest day I will be 100% ready to enter the second week. My plan is to keep pushing to gradually get myself as close as possible to the top." "Today's stage was shaping up to be quite tough and I love racing in extreme conditions. So far I've had one great day followed by a mediocre day. Considering yesterday wasn't my best day, I was expecting today to be a lot better for me. Today's stage would also be tricky in terms of navigation and I think it'd be a good opportunity to make a difference. But in the Dakar you don't really have time to worry about the past. I'm happy I reached the halfway mark and I now need to focus all my thoughts on the coming week. We'll have some time to make our plans with the team tomorrow so that by Monday morning we'll be ready to take on another long and exhausting week of racing here in South America."